It’s April now, and though the term is supposed to be winding down, you feel like it’s only speeding up. Assignment deadlines are fast approaching. You have four readings that you’re expected to finish before exams tomorrow. You haven’t eaten a vegetable in a week, the other members of the clubs you’re involved in have forgotten what your face looks like and a friend of yours is going through a rough patch, which means they’re leaning on you for emotional support. Your mom is upset that you haven’t called her lately. You’ve got a lot going on. If this situation sounds familiar, you are definitely not alone. An integral part of self-care is learning to cope with difficult situations such as these. How do you juggle all these responsibilities and make it through to May with a smile instead of a grimace? There’s a simple answer to this question, though it is much more challenging in its application: boundaries. In order to practice effective self-care, you need to know your own boundaries, which I’m going to define as the lines you draw between yourself and other peoples’ expectations of you. If you don’t know your own boundaries, taking care of yourself and treating your body and mind with respect will likely prove to be illusive goals. You have to define what exactly is too far or too much for you in order to know how much you can achieve without negatively impacting your mental health. Setting boundaries means specifying to the people in your life what you can give and share, but also what you need from those relationships. This can take many forms. For instance, returning to the example I began with, say your friend is struggling with their mental health. They come to you primarily for emotional support, and nobody else in their life is aware of how bad things have gotten. As much as you care about them, you find it exhausting to be the only person that they feel they can tell about their struggles. Setting a boundary here is extremely challenging because your friend has told you repeatedly that they need you, that you’re the only one who understands. You may feel guilty, even obligated, to be the emotional support that they need. However, taking on someone else’s burden (with nobody else to share the weight) can lead to a rapid deterioration of your own mental health. Our health and happiness has to be our first priority. Nobody else is going to be there setting boundaries for us; that job falls to us alone. If we take on too much in our relationships, often the result is that we feel drained and used up, which adds to all the other stressors that are inevitably happening. This isn’t to say that looking after your friends (and being looked after by them) isn’t healthy, loving, and productive, but if you don’t make yourself your first priority, who will? Also, it’s hard to take care of someone else if you haven’t taken care of your own needs first. Setting a boundary with this friend does not mean you’ll never talk to them or that you can’t still be there when they need someone. What it means instead is saying things like, “Have you considered telling anyone else about this? 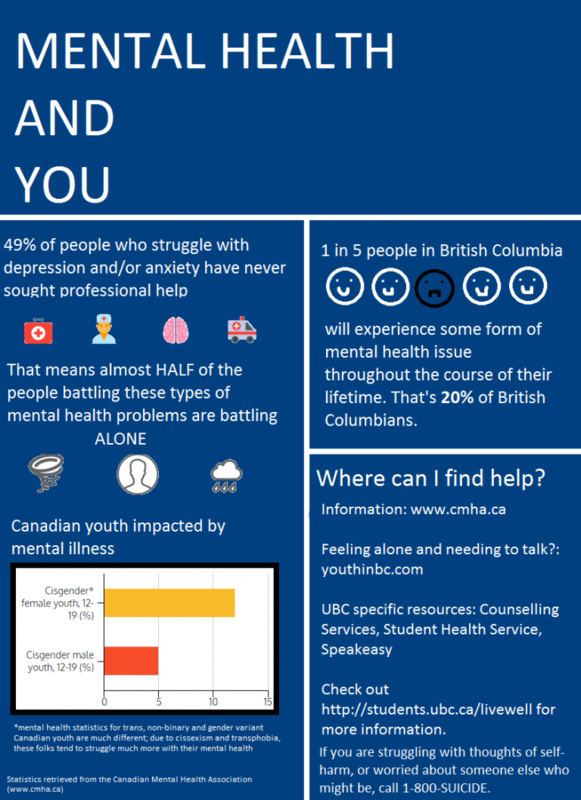 What about going to the doctor or seeing someone at UBC Counselling?” (Or, as a shameless plug for my own blog series, direct them to the infographic on campus wellness resources at the bottom of this post!) Try to gently introduce alternatives and push them towards other resources that not only take the weight off you, but are also professional and qualified to handle questions of mental wellness. You can absolutely still be there as a support, but if you’re their primary “person” to come to and/or you feel like you have too much happening to support them without harming yourself, you are more than justified in taking a step back. Remember that boundary-setting is a continuous and negotiated conversation. Maybe a month from now, you’re feeling like you’re in a better, steadier place to be more involved in supporting this friend of yours – or maybe the level of support they need continues to be a little too much for you, and the take-home message of this is that either way, that’s okay. You have to prioritize your own wellness before you can commit to someone else’s. Like anything else that is difficult in life, setting boundaries takes practice. However, like a lot of other difficult things, it’s an extremely worthwhile skill to have. Setting boundaries with your loved ones may not erase your academic stress or fix your lack-of-vegetables situation, but it’s definitely a way to manage emotional exhaustion and ask for the support you need so that you can keep pushing forward. Good luck with final exams and papers, everyone – you will make it through this! We are really happy that the article does help you with your study and research! We will post more blog posts relate to it. Stay tuned! this info, you could hellp them greatly. That’s what we do! Share it to your mates and help more people too!